(‘-‘*)ｵﾋｻ♪ Long time, no see. In the past couple months, I have made ~65 batches of chili (Jk, it’s prolly closer to 8, but it feeeeels like more), been on multiple road trips, gone through 2 fits of a bad cold, met multiple members of my boyfriend’s family (*≧▽≦)オハツでっす♪, planted herbs for cooking with, and began the Spring cleaning. Phew! Anyways, enough rambling, on with the show! 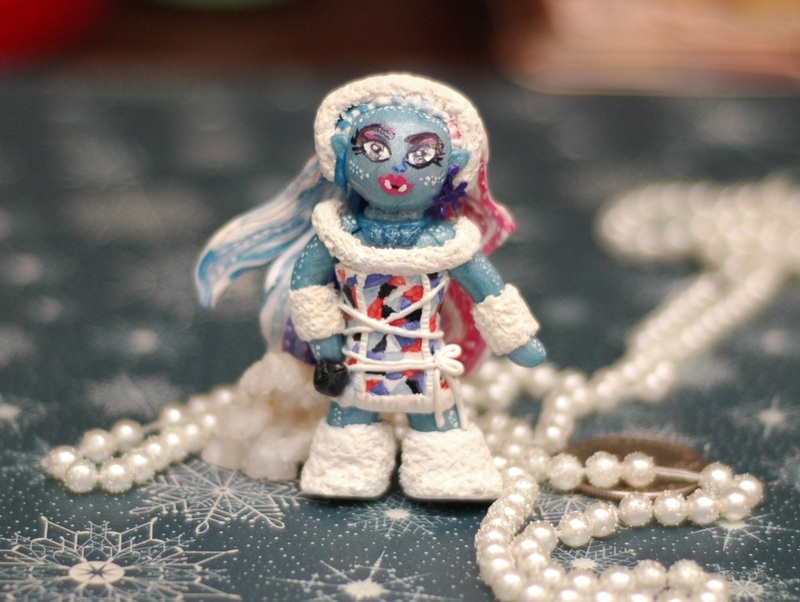 The first piece is a character from Monster High, Abbey Bominable, the daughter of the Yeti. Unbeknownst to most of my friends, I really like the Abominable Snowman, Jack Frost, the Snow Queen, and other characters that deal with coldness/ice/snow, though I am not sure why since I can’t stand cold weather. xD So, given that fun fact, I decided to craft this character first for my upcoming Monster High series, because she’s my favorite character so far. Yay! first image which I added a little extra flair to the foreground 🙂 I am trying to make my pictures look better, hopefully it works. 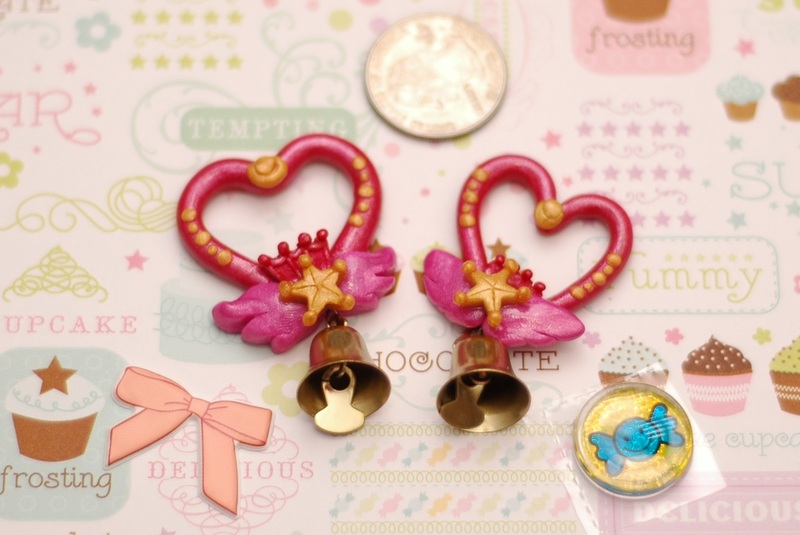 Of course I couldn’t stay away from making Sailor Moon stuff for long, right? 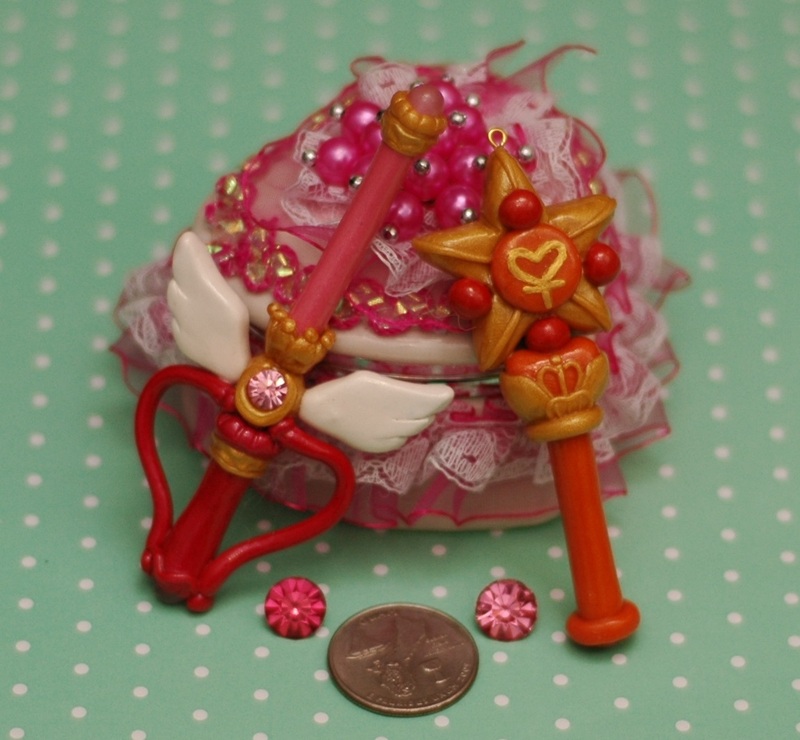 The two wands are Sailor ChibiMoon’s Pink Moon stick. 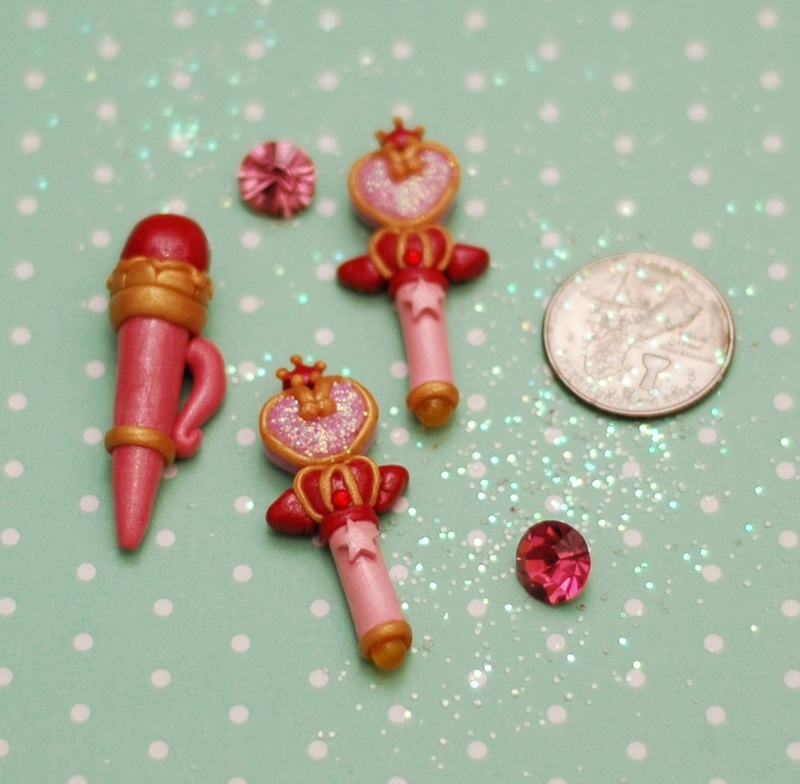 On the left is Sailor Venus’ transformation wand. 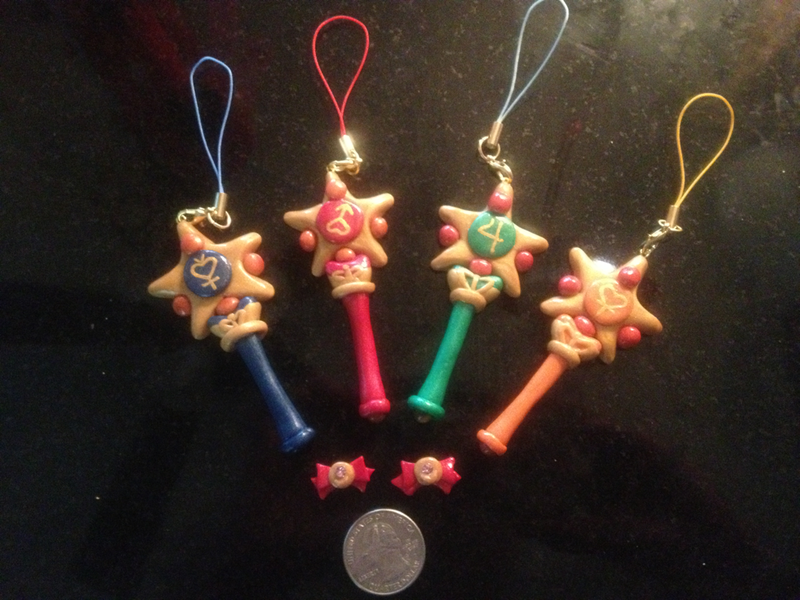 I made two bells and two Chibimoon wands so I can keep one and give the other to a friend. 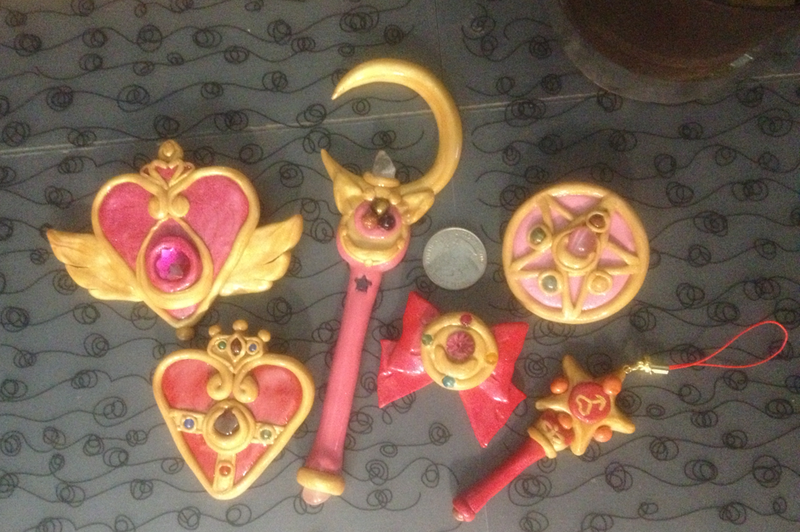 She also ordered the Sailor Venus wand and a few other things. (’-’*) フフ Big shout out to Cam-O-Chan for the encouragement and support!!! 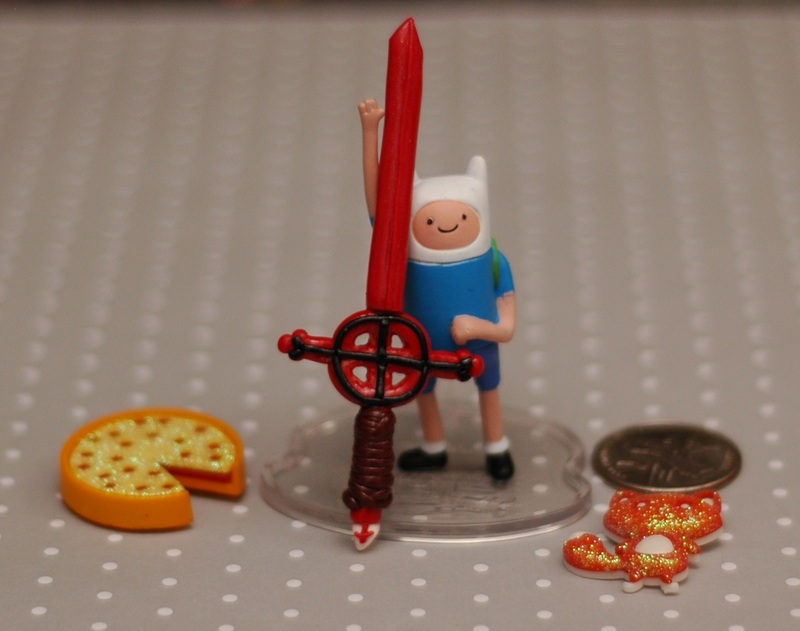 When I showed my boyfriend the Sailor Moon sword, he reminded me that he had requested an Adventure Time sword, but that was right around when I first started crafting with clay, and I had forgotten since then |･ω･｀)ｺｯｼｮﾘ So I figured after I made me a sword, I would make him a sword, which means we both got swords! Yay! Sword fight! The next pictures were taken with the cell phone, so I apologize for the quality. They were gifted as Christmas presents or had to be delivered quickly before I decided to take on the camera again. These were given to my BF’s twin sisters. 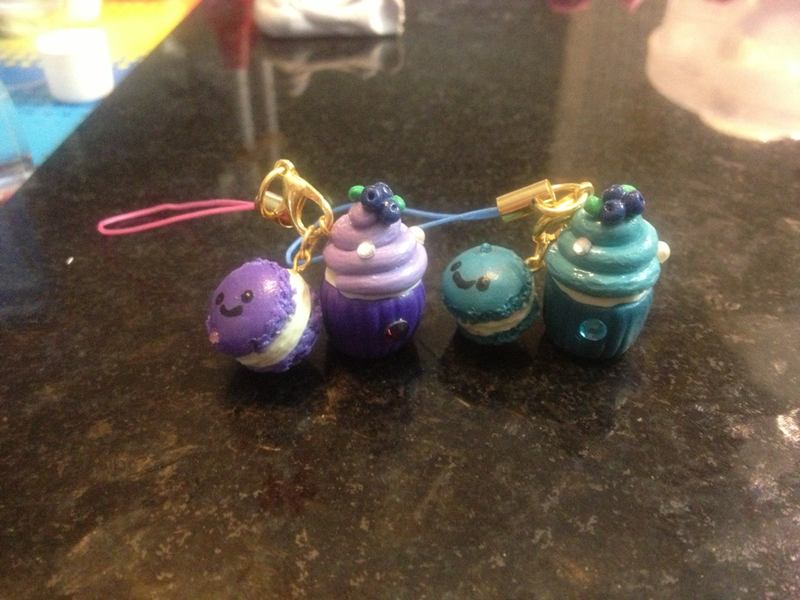 I think they came out really adorable. The reason I made this is because the BF’s grandma crafted him a quilt for Christmas. It was even featured in a quilt show! 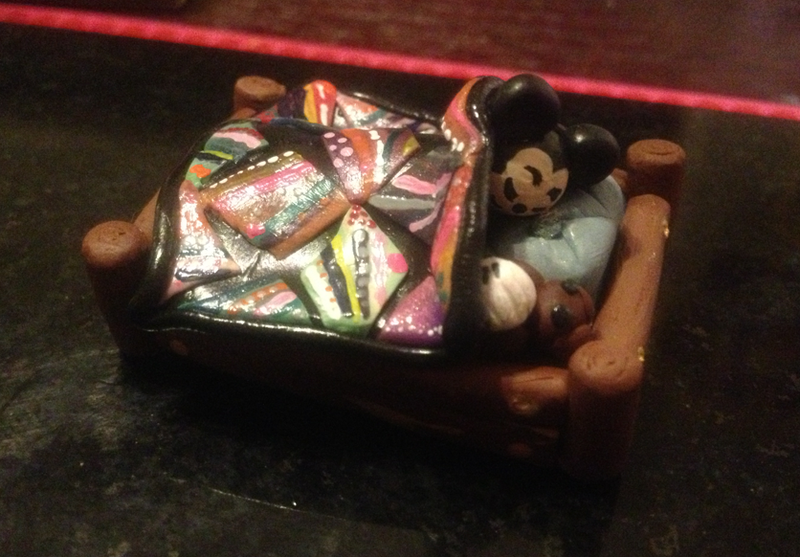 Anyways, since she was giving the quilt to him, I wanted to try and replicate the pattern on clay for her 🙂 She loves Mickey Mouse so I combined the two for this piece. The following two below are a big Sailor Moon haul that left home very quickly. It’s all about the bow. That’s my favorite piece in this bunch. 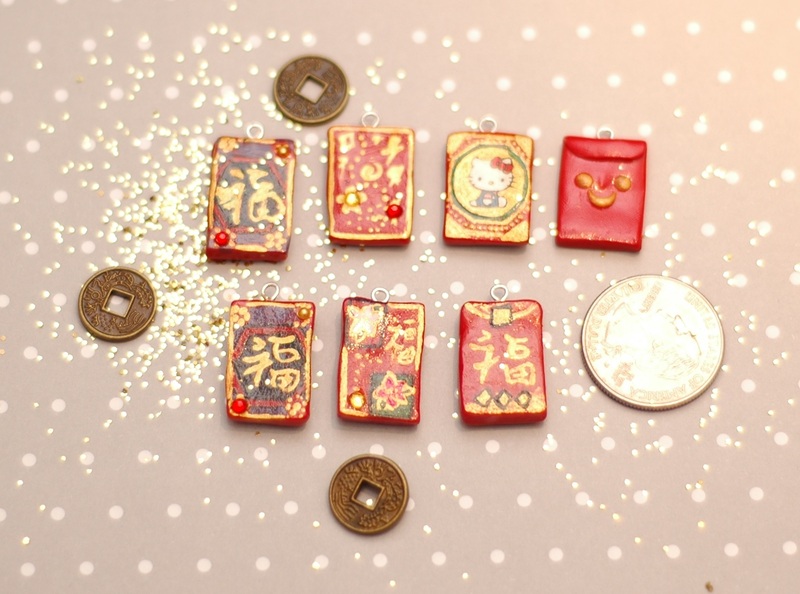 The transformation wands for each Sailor of the inner planets. left to right – Mercury, Mars, Jupiter, Venus. It was a lot of fun painting the pictures on these. 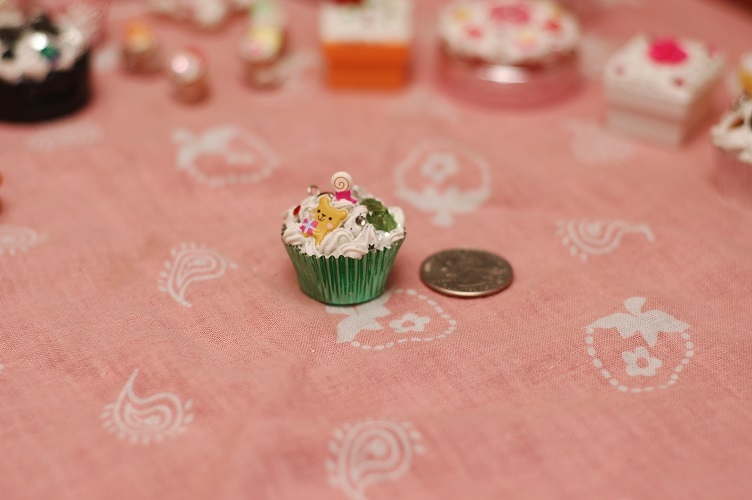 In fact, so much fun that I had contemplated making another batch! I hope everyone had a good holiday season and also that your New Year is off to a good start! Yeah I know I kinda am posting this in reverse, but these are some of the things that didn’t come out in the first round of pictures. So yeah, at least I’ve come a long way since these… I think. 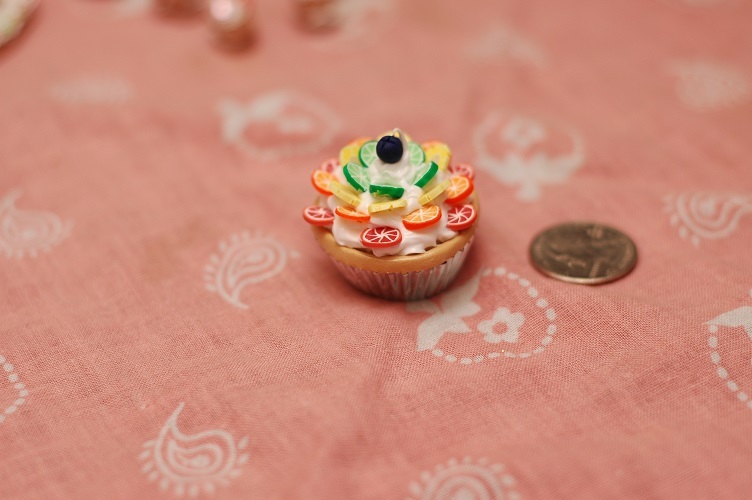 Cupcakes are pretty fun to make too, the only downside is they take a lot of clay and or “frosting”. I’ve been trying to get these down since day 1 and still feel like they are sub par. Let me know what you think and where improvements can be made! 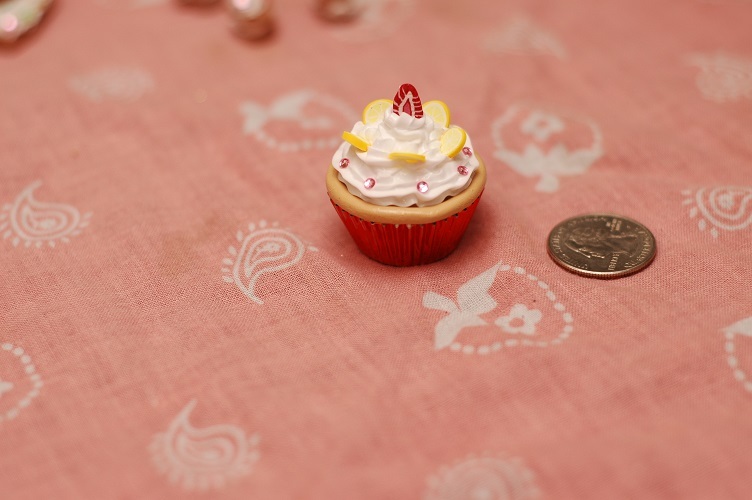 This one was SUPPOSED to be a cupcake (like all 3 of these) but it looks like a Strawberry Lemon tart, which is okay with me. A wanna be cupcake posing as a tart under the guise of “lemon lime flavor cupcake” :P… The jig is up little dude! 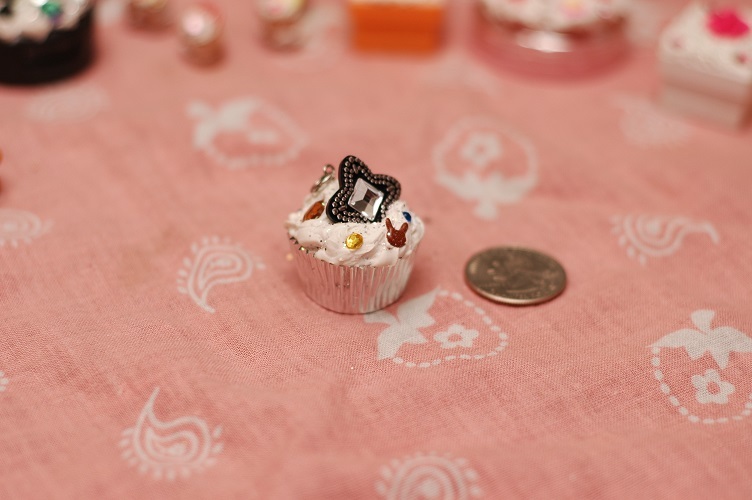 There are a couple more proto type cupcakes that didn’t come out in the first round of pics which will be posted soon! Oh and my secret t.a.r.t. project is coming sooooon too.